The three main characters take turns narrating, and minus her zillion references to Sami’s green eyes, Fatima’s chapters are the strongest. She has so many conflicting emotions and thoughts—love for her family, for the natural beauty of her home; frustration with her lack of choice and lack of agency, she’s angered and betrayed by her father’s hypocrisy and her mother’s viciousness; she has a true and abiding belief in God, but some serious skepticism about whether or not it’s really His will that other people are carrying out—she’s believable, she’s easy to empathize with, and above all, while she chafes at the restrictions placed upon her, it never feels like Fatima is a stand-in for Western reader: She is who she is, a product of her situation and her environment, a Hazara girl who happens to love a Pashtun boy. Points for SO MANY THINGS: all of the period detail; the palpable love of art; the fact that while Vicky is frustrated and angry that she appears to be the only person who doesn't have a say in her own future, she's still a product of her time—her growth and understanding and independence is slow-going and hard-won (in other words, she's not a 2014 girl wearing 1909 clothing, she's a 1909 girl through-and-through); that while, YES, there IS A LOVE TRIANGLE with a predictable outcome (toolish rich guy who can offer comfort and stability versus dreamboat feminist police constable who is also Vicky's muse), that there is a second love triangle that pits Vicky's family, her way of life, certainty of shelter and clothes and money, and everything she's ever known AGAINST the freedom to make her own choices and decisions, and basically everything she knows she needs to be happy, in her heart and her soul and her head. Double points for an extensive historical note. They have entirely different voices—and it's just a flat-out great story of two very different girls learning to live together, trust one another, and become each other's family. These girls aren't romanticized, aren't infantilized, aren't represented by insulting tropes, they are individual people with well-rounded, distinct personalities, and while they certainly change the lives of those around them, they also have a lot to learn from each other. I didn’t even touch on how rich the book is in terms of culture and within cultures: teen, American, Mexican-American, secular Catholicism, fundamentalist Christian, generational. Or about how it deals with the fallout of addiction and the mixed and confusing push-pull feelings of hope and despair, love and rage, pity and contempt that family members experience. 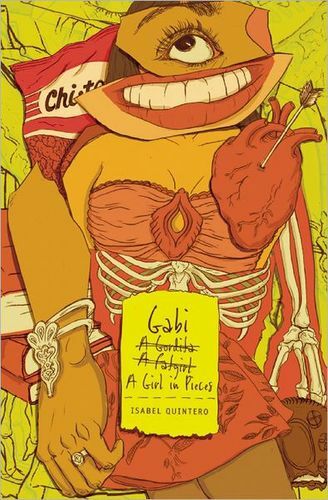 Or about Gabi’s poetry, which is totally solid, and her eight-page zine, which should be required reading for EVERY HIGH SCHOOLER EVER. Or about how friendship means that sometimes you keep your mouth shut, because some stories aren’t yours to tell. Or that it’s possible to love your family, but you don’t have to live your life exactly the same way, that it’s okay to make different choices, to go your own way. Funny and smart, with believable dialogue, and even in just this one issue, a whole bunch of distinct, three-dimensional characters are introduced. Kamala's various struggles are specific to herself and her situation, but are also totally relatable. It's geeky and full of pop culture fun—there's a Star Wars joke on the first page, a meathead refers to Kamala's friend Bruno as Good Will Hunting, and Kamala writes superhero fanfic. On book reviews and criticism.